Everyone has seen Baby Andy Reid and Baby Mark Mangino. 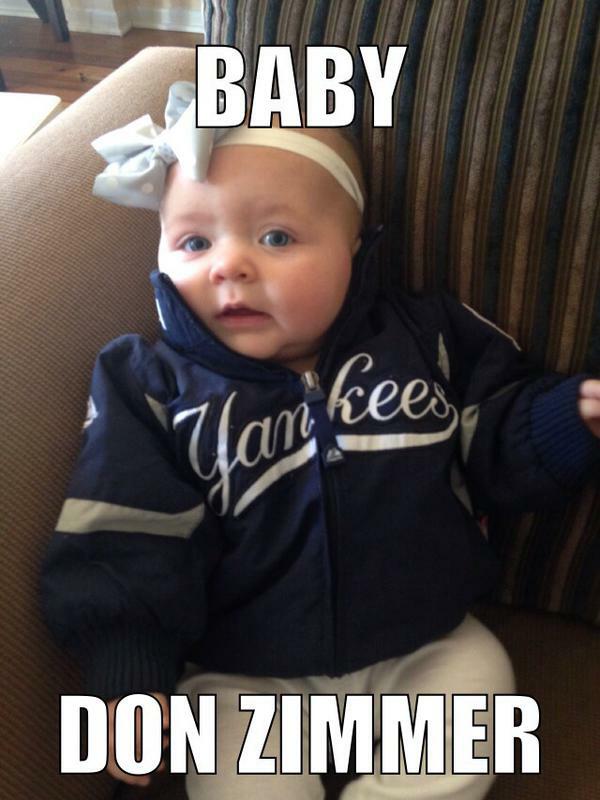 But to celebrate Opening Day, my wife dressed up our daughter as former Yankees Pitching Coach Don Zimmer. It’s pretty good – she even has Don’s steel blue eyes – but my wife went and ruined it with that headband. They’re out of town for the week somewhere in Yankee-land, but I’ll have it known that my daughter is NOT a Yankees fan but a Cincinnati Reds fan and this was done by my wife against my will. Because my kid is cute in that puffy jacket, and chubby like Don Zimmer in the jowls, I was okay with it this once. Also, my daughter is named after a baseball player which my wife hates to admit but her name was not picked off the internet and shall she see this post; and she will because she likes to check up on exactly what I’m up to; I just want it to serve as a reminder. Baby Don Zimmer? Baby Don Zimmer. Someday my daughter will look back on this and laugh about her first Opening Day. If only we had a little Baby Pedro with a grease curl to sit next to her, we would have been internet famous.